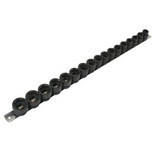 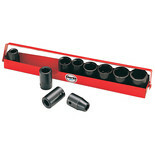 This heavy duty ½" square drive impact socket set is designed for daily use. 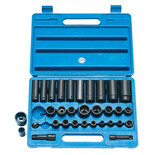 Suitable for air driven, mains powered and cordless impact wrenches and ratchets. Supplied in a strong case. 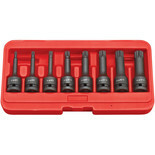 A set of 8 impact quality spline bits with ½” drive bit holder. 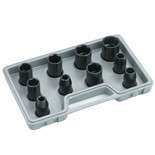 Supplied in a sturdy metal case. 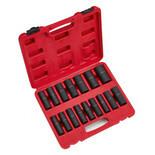 This heavy duty impact socket set features both 3/8" and ½" square drive sockets and is designed for daily use with air driven impact wrenches and ratchets. 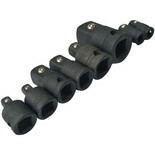 This 6 piece set of Clarke impact socketshas been manufactured from chrome molybdenum steel with a black phosphate finish to resist corrosion. 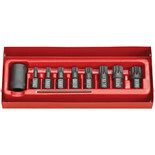 This set is completed in a case for easy storage. 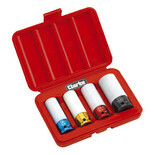 ½" square drive sockets for use with air powered, mains powered & cordless impact ratchets & wrenches. 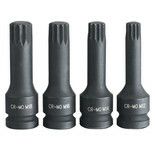 High quality chrome vanadium ½” square drive impact sockets. 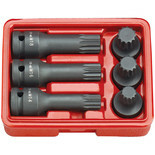 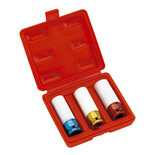 A set of 6 impact quality 1/2” drive spline bits supplied in a sturdy metal case. 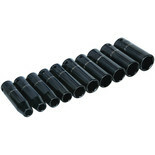 A set of 8 impact quality 1/2” drive spline bits supplied in a convenient moulded plastic case. 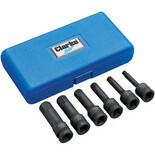 A set of six impact quality 1/2” drive spline bits supplied in a convenient moulded plastic case.